Cut cookie dough in half crosswise. In large bowl, place half of the dough. Break up dough; stir in 1/4 cup of the flour until well mixed. Wrap dough in plastic wrap and refrigerate 30 minutes or until firm. Meanwhile, in same bowl, break up remaining dough; stir in remaining flour and the cocoa until well mixed. Wrap in plastic wrap and refrigerate 30 minutes or until firm. To make pinwheels, place peppermint dough between 2 sheets of waxed paper; roll into 10x12-inch rectangle. 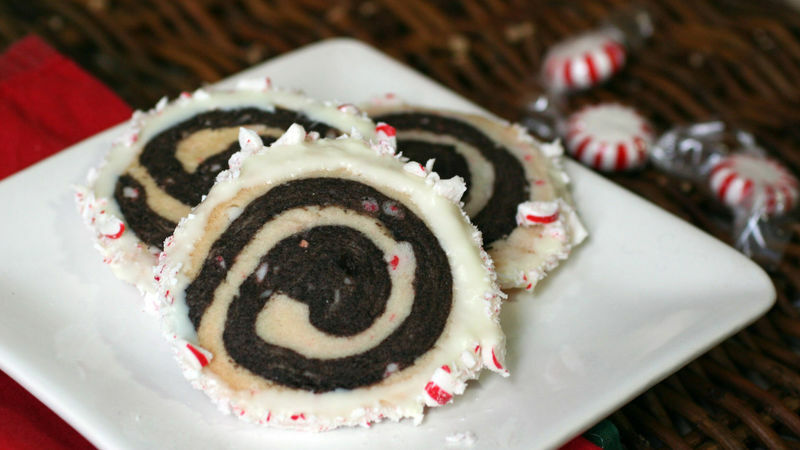 Repeat with chocolate-peppermint dough. Peel top sheets of waxed paper from both doughs. Turn chocolate-peppermint dough upside down onto peppermint dough; roll up doughs together, starting at long side, into a log. Heat oven to 350°F. Line cookie sheets with cooking parchment paper or use nonstick cookie sheets. Cut dough into 1/4-inch slices with sharp knife; place 1 inch apart on cookie sheets. Bake 15 to 18 minutes or until edges just start to brown. Remove from cookie sheets to cooling racks. Cool completely before decorating. In microwavable bowl, microwave baking chips uncovered on High 1 minute; stir. Microwave 30 to 60 seconds longer, stirring every 30 seconds, until melted and smooth. In small bowl or on piece of cooking parchment paper, place crushed candies. Dip edge of cookies in melted chips; roll in crushed candies. Place on sheet of cooking parchment paper; let stand until set. Store in airtight container, using waxed paper between cookie layers. If dough becomes too soft to work with, refrigerate 30 minutes. To crush peppermint candies, unwrap and place in food-storage plastic bag; crush with mallet or rolling pin.